Without Polycarbonate Machine Guards, the potential for serious injury is always present when machinery is in motion. Sharp edges are rotating and cutting components to size, or flat panels are slamming down on powerful pistons to crush waste material into compact packages. One careless moment in this or any other machine-heavy area would be enough to cause a nasty injury, one that has the potential to end life. Thankfully, there’s a line of defense that stands between your employee and this hazardous mechanical area. The embodiment of this shield is found in the installation of machine guards. Far from being perceived as peripheral parts of a machine, trained employees are always made aware of such guards, how they function, and what will happen if the barrier is not in place. You can see examples of Polycarbonate Machine Guards in action everywhere. As one example, check out the belt drives on motor assemblies. Often made of metal, they’re equipped with a grille to improve heat dissipation. Now, while metal guards have always had this role in industry, other environments have turned to engineering plastic as the optimal answer. It’s true that metal will defeat bodily contact when a sealed machine is nearby, but what about the assembly line devices that are only partially enclosed? This scenario and instances where contact is either partially accessible or brought about during key moments of a lengthy process requires a more elegant solution. Think about a machine tool setting where drilling and CNC operations are being carried out repeatedly. The process is directly interfaced to human input. Tough plastic machine guards are fabricated for just such applications. A clear Perspex or hard Acrylic composite moulds to cover every possible access point, allowing the operator to safely monitor the task without injury. 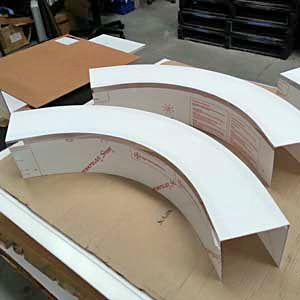 The dynamic forces in play on the other side of this setting reinforce our case study by providing a solid rationale to form the guard from an abrasion-resistant material that incorporates a certain amount of elasticity. Not fabricated from an engineering plastic that could be considered truly pliable, the acrylic and polycarbonate guards are nonetheless formulated to absorb energy. This means sparking metal fragments and rough-edged materials may fly off a component as it’s shaped by a subtractive CNC router operation, but the protective screen will absorb this high-energy explosion of subtractive debris. Though often seen as the transparent energy-absorbing plastic barriers that are placed between a tool operator and a hazardous working environment, we’d be remiss in not entertaining other scenarios. Plastic machine guards act as bumpers and handrails during an assembly line process where human operators are in attendance. They act as spring-loaded guards that are integral to the outline of powered hand tools. And though these machine guards are often connected to some form of dead-man’s switch or an electronic sensor, a safeguard that stops the machine if the shield is not in place, we must still consider the physical nature of the fixture as a first line of protection. Remember, thanks to these simple attachments, industrial injury figures are consistently kept low.